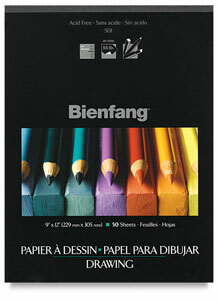 Bienfang's Giant Drawing Paper Pad offers medium-weight paper with a light tooth. Excellent for use with pencil, pastel, charcoal and pen and ink. 55 lb (90 gsm). Acid-free paper contains 50% recycled fibers. 50-sheet pads. Tape-bound on the short side. Giant Drawing Pad, 9" × 12"